First and foremost, Happy Friday dear hungry souls. May your food endeavour this weekend be filled with much satisfying finds, sloppily-delicious eats and accelerated digestion to allow space for more. Motormouth will be back to Ipoh again this weekend, after last week’s filming of Discover Perak Season 2 around southern Perak (Tanjung Malim – Bidor – Sungkai – Kampar – Teluk Intan! ); one manic marathon of food extravaganza spanning two full days; encompassing more than 12 hours per day! (this follows the Discover Perak Season 1 filmed 4 years ago). Needless to say, everyone of us was thrown into a food comatose stage; partially compounded by sheer exhaustion of eating, talking, and traveling as well. But all in all, the experience was priceless. 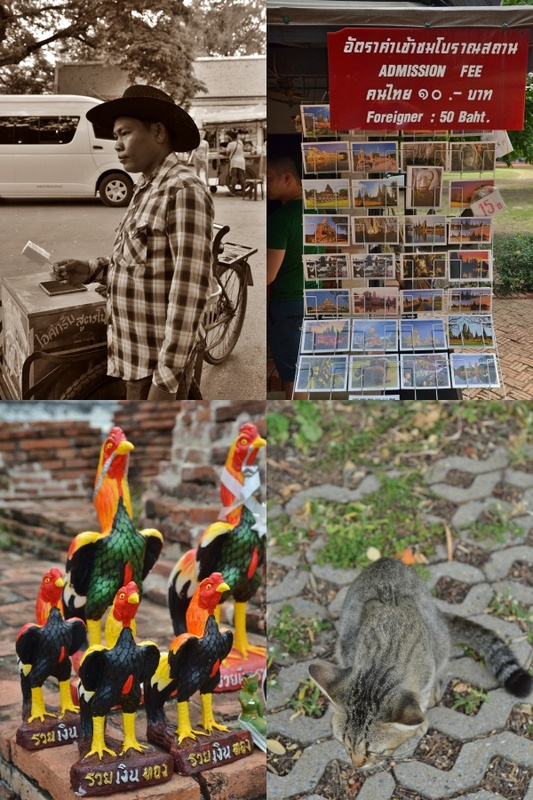 Ayutthaya; the ancient capital and now modern city in the central plains of Thailand is situated about 85km north of Bangkok; and can easily reached by chartered transport, public buses or even through a more scenic route by train from Hualamphong station in Bangkok. The town is a labyrinth of ruins from ancient kingdom and temple grounds; some populated by the infamously atmospheric headless Buddha statues; remnants of the Burmese invasion in the mid 18th century. 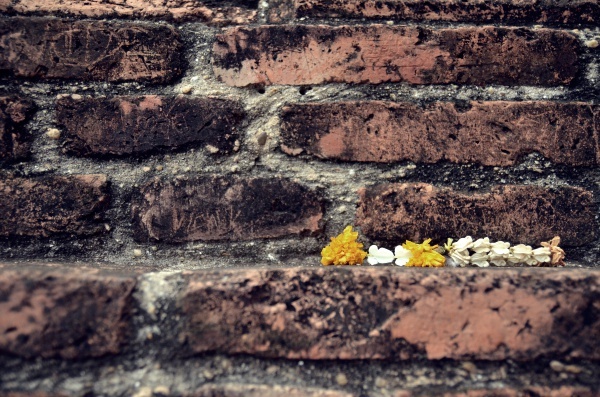 Take a deep breath and savour the shots taken during this half a day trip to Ayutthaya. We took a van from the depot near to Victory Monument (reachable by BTS sky train), for about 250 baht per pax. Or around that price. Sorry the mind got muddled after a good 9 months after the journey to Bangkok. The trip took us a good 2 though, the traffic not helping much. It was not excruciatingly lengthy though (I will save that painful story for Pattaya later). Upon arriving at Ayutthaya, we chartered a shocking pink-coloured songthaew (tuk-tuk) that could fit the 8 of us, for a half day journey including several stops and a lunch place of our choosing. Remember to reiterate the point that you MUST go to your preferred lunch place; preferably with name and address or contact number included. As the driver will exhaust all avenues and tricks to persuade you to pick his recommendation instead (some seafood place, I remember). A scam, no less. The half-day (which was then extended with minimal top-up) hiring of his service and the relatively fun ride around town came to less than 300 baht per person. Or that’s as best of an estimate no thanks to this failing aged mind of Motormouth’s. 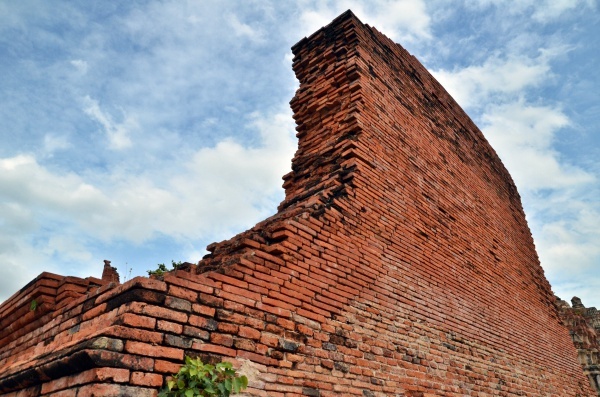 There are many ruins and temples in Ayutthaya. If you love to cycle and decided to spend a night here, then renting a bicycle and cycle at your leisurely pace will be just as fine. Since aside from ruins, temples and historical grounds and structures, there’s not a lot to do in town anyway. 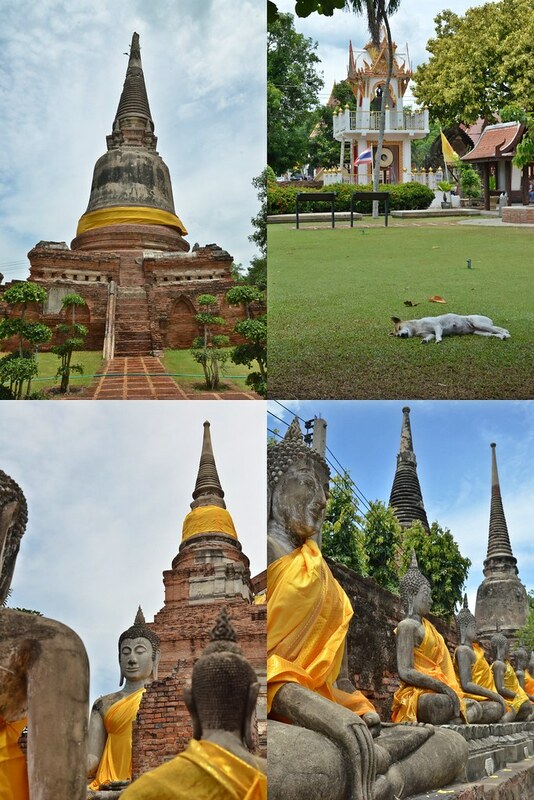 There are quite a number of temples and ruins in Ayutthaya; most accessible by public transport around town or by bike, or if like us you can actually choose which temples you want to visit or omit, and plan your itinerary around your needs. 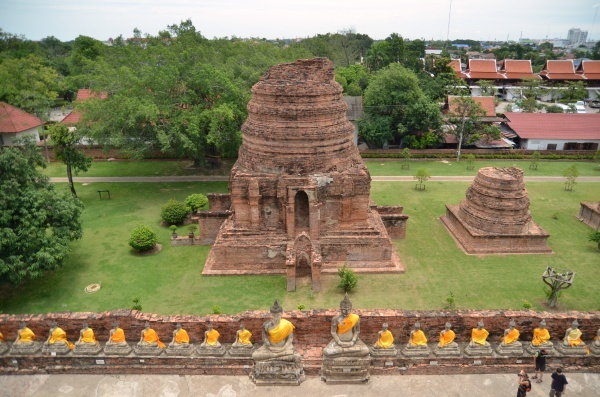 Wikitravel’s guide on Ayutthaya has almost the bucket list of famous temples, and they don’t differ much from one another save for a few, so by all means go with your instinct. We spent a fair bit of time at Wat Yai Chaya Mongkol; a relatively well-preserved temple that’s very photogenic, and the main structure (Chedi) of the temple stands more than 60 metres in height and you can climb and take scenic shots of the surroundings. Admission fee was about 20 baht per person only, and we took quite a number of shots juxtaposed against rows of Buddha statues draped in saffron robes. 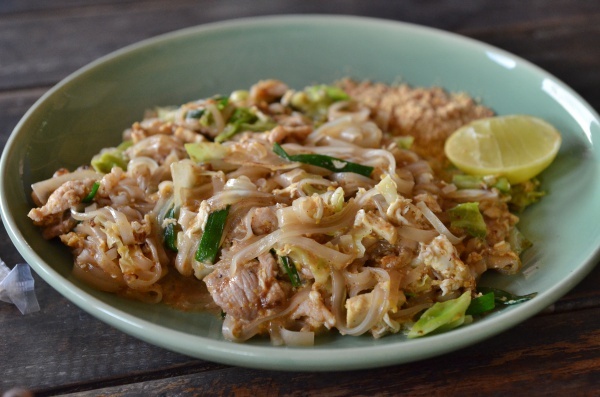 Pad Thai @ Malakor Restaurant – The quintessential Bangkok street food of stir fried rice noodles with eggs, shrimp/pork/chicken, scallions and crushed peanuts, sugar and a squeeze of fresh calamansi to perk up the flavours. 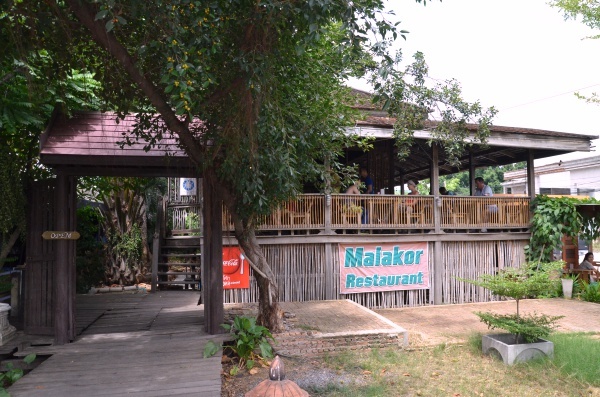 It was near lunch hour after the first temple, thus we opted for an early lunch at Malakor Restaurant. It came highly recommended through TripAdvisor and also listed in Wikitravel and some other websites, thus I made a lazy decision. Yeah, there were a fair share of foreigners seated around the entirely ‘kampung’ house-like wooden structure; with low tables and cushions as seats. But I did not suspect anything amiss nor intending to go with the driver’s recommendations. So, no matter how modernised or commercialised Malakor could be, I was game to try them out. Ended up pretty satisfied with the selection of food (mostly Thai) and drinks, everything was priced rather reasonable (below 100 baht per portion) and delicious to boot. Located at the junction of Chee Kun road opposite of Wat Ratchaburana; a temple, the view was excellent with cooling breeze to tamper the heatwave that was crippling us that afternoon. They were able to whip up vegetarian fares as well; not half-baked attempts but the sensational Malakor roasted rice with crunchy bits of pineapple, carrots, raisins, onion, and cashews combined with a blend of spices. The batter-coated pork with fried red grain rice and a sweetish chilli dipping sauce was excellent too. Capped off the feast with a serving of icy cold Thai milk tea or coffee. 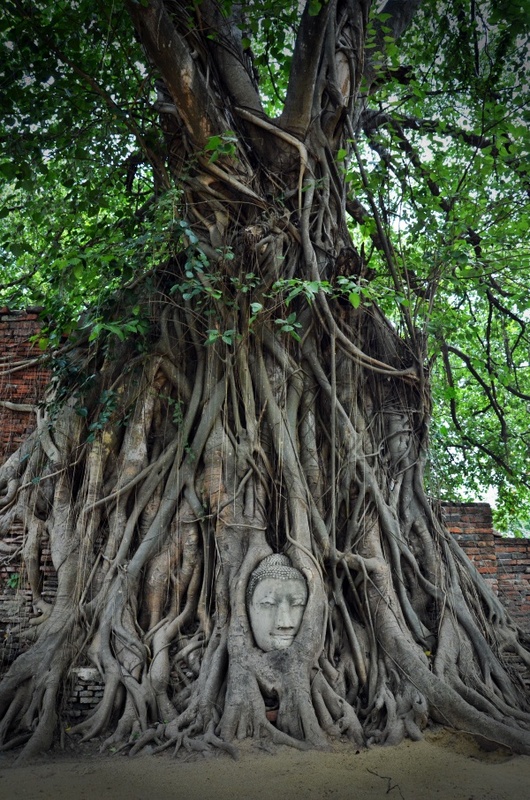 Then we continued on our temples hopping spree; to Wat Mahathat where the most iconic Buddha statue head appeared to be embedded or grown into the roots of a large sacred fig tree. 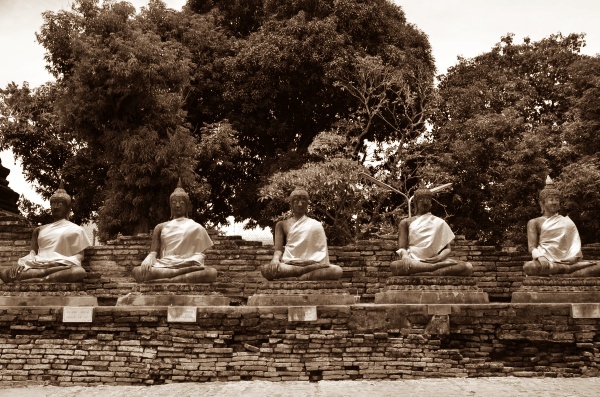 The spacious grounds also hold various dilapidated structures, and rows of headless Buddha statues; a grim reminder of the ransacking by Burmese during the tumultuous war period between Burmese and Siamese. 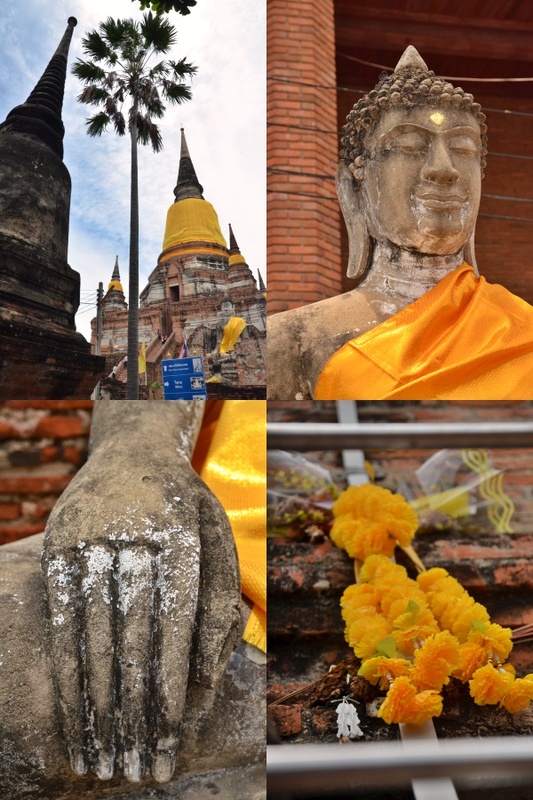 *Wat Phra Mahathat, Naresuan Rd (Across the road from Wat Ratburana). A large temple that was quite thoroughly ransacked by the Burmese. Several leaning prangs of Ayutthaya are still feebly defying gravity though, and the rows of headless Buddhas are atmospheric. This is also where you can spot the famous tree that has grown around a Buddha head. 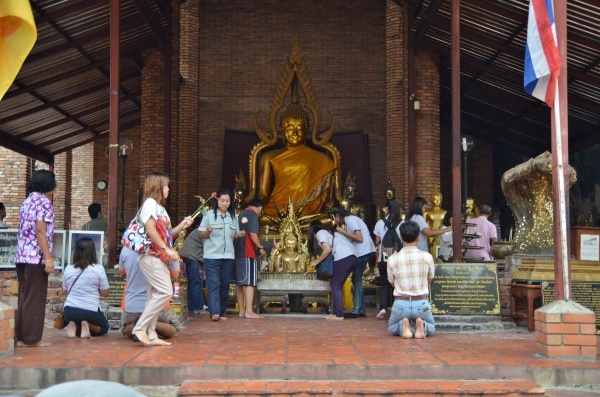 When taking pictures of you and the Buddha head, make sure you kneel to show respect, as it is considered holy by Thais. 50 baht. The elegant white structure of Wat Phu Khao Thong (Monastery of the Golden Mount) was built in 1395, and despite the peeling paint and lack of lustre, the serene grounds was a calming sight; perfect for a climb to the top and admire the view of the surroundings. 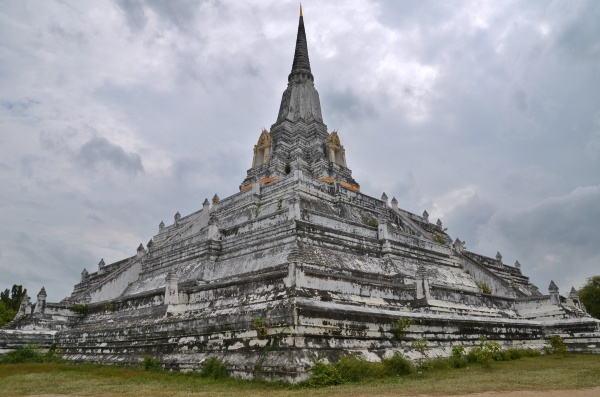 *Wat Phu Khao Thong, (About 3 km north of town, west off the Ang Thong Rd). Impressive and huge white, and slightly wonky, chedi set in a big field. You can climb to the top for extensive views over the countryside surrounding Ayutthaya, although the modern town and power lines obscure much of the historic city on the horizon. The actual nearby temple is still working and has small grounds with a smiling fat buddha image set in the ruins of a small viharn. 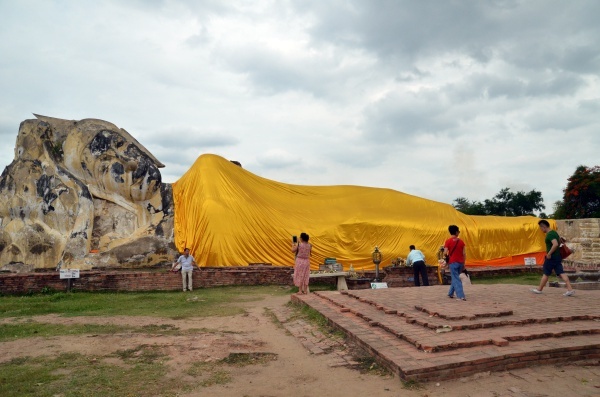 You will see the ‘Monument of King Naresuan the Great’ on the way. Free. Wat Lokayasutharam (Temple of the Reclining Buddha) was our last stop before proceeding back to Bangkok for more eat, drink and be merry moments. *More on Bangkok and Pattaya in future posts. For now, I wish you a great weekend ahead, and if you’re traveling home for Qing Ming festival, please remember your loved ones at home. 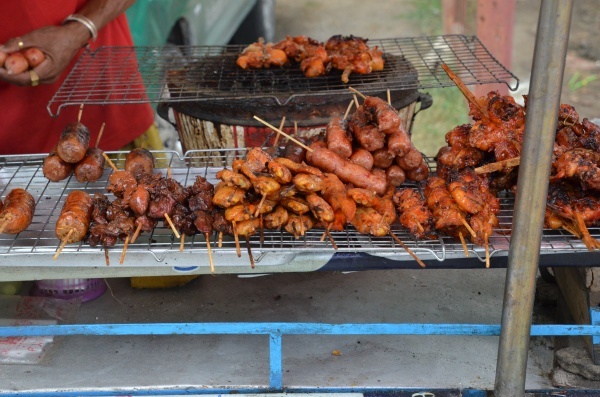 The full Bangkok 2013 series should be digested at your pleasure.